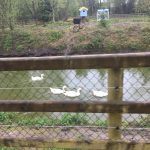 Our visit was on Good Friday (14th April), and we had the slot from 3.40 booked. 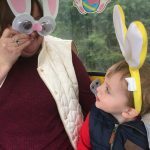 We were told it would entail an hour long event, encompassing an egg hunt, a train ride, meeting the Easter bunny and receiving a chocolate egg and hot chocolate. 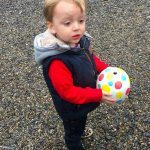 Since myself and Eliott were off on our holidays in Wexford for a few days visiting family, it wasn’t as long a journey as it would have been, it took us just over 70 minutes to get there. 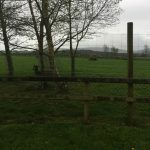 We counted every cow, sheep, tractor, tree and car on the way. (Who said travelling with three year olds wasn’t joyful?). Once we hit about 10km from Tullow, it started lashing rain, and stayed that way for the afternoon. We were early for the event by about two hours, as we’d decided to get lunch and wander around first. 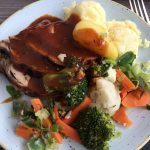 The restaurant in Rathwood has been great any time I’d been there before, and it didn’t disappoint this time. Both myself and my mam got a full dinner for €10.50 each, which had us feeling full to the brim. Eliott opted for a roll with some sausages, which was €2.60, which he happily munched on. It was very crowded and there was only one person on the till, which didn’t feel like enough, but aside from that the eatery element of the day was brilliant. 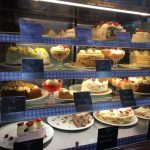 The delicious cakes were staring at us as we ordered, so we’d decided that we’d later get the Slice and Coffee deal (2 coffees, one cake slice for €8.95) after the Easter train event was over. 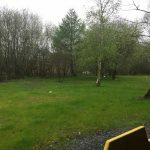 The afterwards wait was where we fell down – unfortunately, it was teeming down rain, so we couldn’t head out to the playground. Rathwood has a lot of very beautiful, very breakable things that toddlers will love giving you heart attacks with by running at them. There were a few threats of leaving to go home before getting to see it. So, for me, I wouldn’t head there too early on a rainy day! There was some extra activities on in a semi-waiting area, spinning tea cups, a photo booth area, but these were all extra. In the same area there was also a massive stand selling balloons for five euro – and every child I saw seemed to have one. We thankfully avoided a meltdown as he didn’t seem too pushed, but to me it felt a little manipulative on parents as an extra expense. Our train ran into some delays, so our session didn’t start until 3.50pm. 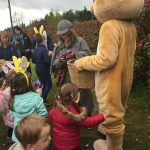 We were met by Mario, a Sherlock Holmes type who was to help us find the Golden Egg so that we could save Easter and ensure the chocolate was going to be coming. She was enthusiastic, loud and seemed to really love her job which is always great to see. 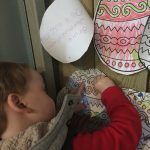 Our first stop was to the Crafting Room, where we met the Easter Bunny for the first time. 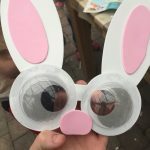 First though, we had to make special glasses so that we could see the eggs. So far, so good. Mario handed out the kits that the glasses came in, and then told us ‘Instructions are in the box”. There wasn’t a demonstration, and from my looking around, I didn’t see any glasses that weren’t made by the accompanying adults – we had about four minutes to make them, and the three year old really didn’t show any interest. I think it might have been better had Mario made a pair herself and shown everyone, it would have been a bit more interactive. 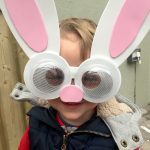 Once the glasses were made, it was time to become one with the bunnies – we were taught how to say yes, no and maybe just like bunnies. Then came the guest star of the day, the Easter Bunny! 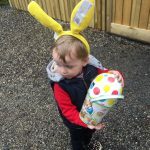 Unfortunately the Easter Bunny wasn’t quite as loud as Mario and was drowned out by the music from the teacup ride, but as a whole the kids got a definite kick from meeting him. Eliott wasn’t too sure what to think of the massive bunny but he came around by the end of it. 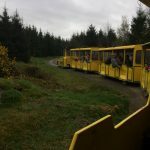 And then – the train ride! This was something Eliott was very excited about. We’re big Choo Choo fans in this house. He sat in between me and my mam, watching carefully as the train driver locked the little carraige door and we set off. The train headed down through the gorgeous grounds of Rathwood, it really is a stunning place. Eliott loved the reindeer (Santa’s reindeer have to live somewhere in the off-season! ), he was VERY enthusiastic about seeing them (and the cows and sheep). 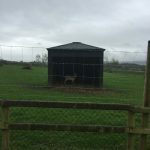 My city boy loves his visits to the country and this was right up his street. The train brought us down to Goose Island, where we were told the Golden Egg was hidden. It was being guarded by the Geese, which was a nice touch. 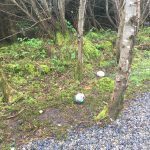 Once the Golden egg was found, we were off down to the barn in the forest, where we had an egg hunt of our own. 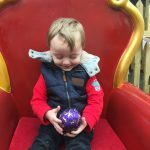 We were told everyone was to get four each, E managed to get a big one and two small ones, and he was happy out. 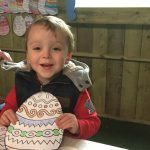 The eggs were to be put into the magical machine in the barn, so that the Easter Bunny could bring us a chocolate egg. Not a big fan of the feeling of the train moving…. Can you see the eggs? Into the magic machine you go! We were treated to some egg-cellently bad jokes courtesy of Mario, who may have come out with every Easter-themed joke in the universe during our train journey. 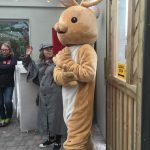 There was also a LOT of “When I say Easter, you say Bunny” which I must admit drove me a bit batty, I hadn’t enough caffeine in me for that kind of thing. One slight worry I did have was that Mario wound up hanging out of the train backwards while it was moving – the Mammy in me went “Oh god, the kids will want to copy her”. 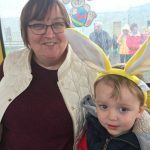 Thankfully none did in our carriage ride but it was a niggling thought in the back of my head (as Mammy to a small boy who likes to think of himself as a Daredevil). 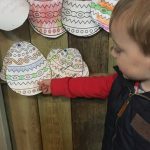 While in the barn, as well as depositing our eggs in the magical machine, we also did some colouring in of an Easter Egg drawing (he may have had some help), and the highlight of his day, sorting coloured balls into bins. Yes, my child seems to find joy in ORGANISING. This is not something he got from me…. Time to organise the balls! 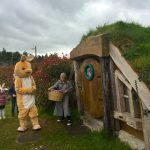 The end of the journey around Rathwood was a visit to the Easter Bunny’s house (he lives in The Shire, it seems). 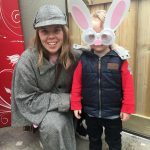 The Easter Bunny handed out a Cadburys Egg to each child, and we headed back to the teacups/photo booth area. 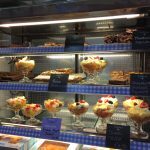 Afterwards, we headed back to the cafe for the much-needed coffee and cake deal (their Mars Cheesecake is divine, me and Mam shared it, and Eliott got his share too). We also got Eliott’s complimentary hot chocolate (we only took half a portion because that much chocolate after 4pm is a recipe for disaster with him). He loved the marshmallows, which was a nice touch. 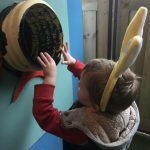 Getting Eggs from the Bunny! So, how do I rate the Rathwood Easter Experience? For my three year old, I wouldn’t do it again. He was too young to really get the whole concept I think, and the activities were definitely aimed at older kids. In particular the arts and crafts section, it seemed to definitely need a lot more adult help. I spoke to other parents doing it, 11 and 9 yr old kids thought it was “too babyish”, so I’d say its more aimed at the 5-8 year old age mark. 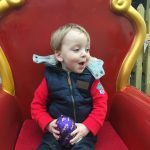 He loved seeing the different animals and the train, so I can see us returning for perhaps a Santa visit later in the year as he’d have more of a clue what was going on, but for the other elements he was just that bit too young. 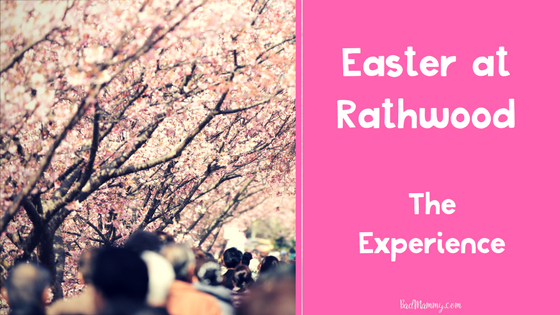 We were kindly gifted tickets to the Rathwood Easter experience in return for an honest review, but ticket prices were €10 per child and €6 per adult, so it would have cost us €22. For that price, I felt that the experience was a bit rushed: we started late and so obviously to catch up and not delay the next group we were a bit more rushed through elements like the crafting. 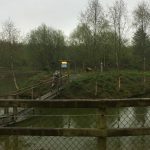 Going on reviews from others who attended on different days, they had a much different experience so it could have been down to it being much busier. In that regard I’d recommend picking your dates wisely, if you’ve got smaller kids perhaps go on the quieter weekdays. 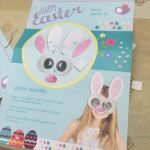 Small things like the volume of the music behind the Easter Bunny talking, instructing the kids on how to do the crafts – they would have made a massive difference. 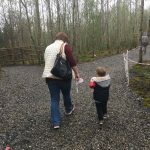 Overall, I’m a fan of Rathwood – I’ve been a few times previously, and it’s a lovely garden centre, we’ll surely be back to visit for the cakes alone. 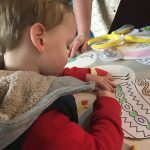 I feel that for these kind of events, Eliott will need to be a little bit older, so we might leave him with his uncles next time and head off for a look around the gorgeous breakables and delicious cakes ourselves. (Any excuse!). 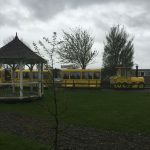 If you’re looking for days out for kids that are about 4-5 and up, Rathwood has Cinderella Experiences going on through the months of April and May (see how Bumbles of Rice got on here), and Teddy Bears Picnics going on throughout the Summer. You can find more information on them here. 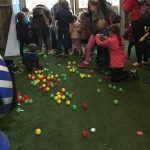 Disclaimer: We were given free tickets to attend the event in Rathwood in exchange for an honest review. As always, photos and opinions are my own (or the toddlers).